Protein complexes perform key roles in nearly all aspects of biology. Identification of the composition of these complexes offers insights into how different cellular processes are carried out. The use of affinity purification coupled to mass spectrometry has become a method of choice for identifying protein-protein interactions, but has been most frequently applied to cell model systems using tagged and overexpressed bait proteins. Although valuable, this approach can create several potential artifacts due to the presence of a tag on a protein and the higher abundance of the protein of interest (bait). The isolation of endogenous proteins using antibodies raised against the proteins of interest instead of an epitope tag offers a means to examine protein interactions in any cellular or animal model system and without the caveats of overexpressed, tagged proteins. Although conceptually simple, the limited use of this approach has been primarily driven by challenges associated with finding adequate antibodies and experimental conditions for effective isolations. In this chapter, we present a protocol for the optimization of lysis conditions, antibody evaluation, affinity purification, and ultimately identification of protein complexes from endogenous immunoaffinity purifications using quantitative mass spectrometry. 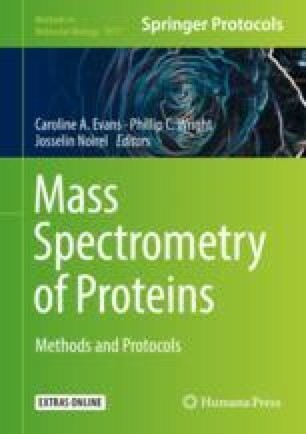 We also highlight the increased use of targeted mass spectrometry analyses, such as parallel reaction monitoring (PRM) for orthogonal validation of protein isolation and interactions initially identified via data-dependent mass spectrometry analyses. We are grateful for funding from the CHDI foundation and from the NIH (GM114141 and HL126509). We thank Todd M. Greco and Elizabeth A. Rowland for helpful comments in the preparation of this manuscript.